Synthetic Grass Warehouse, Inc. (“SGW”) manufacturer’s warranty is as follows if you have purchased synthetic grass manufactured by Synthetic Grass Warehouse, Inc.
SGW warrants that if the synthetic grass it manufactured and supplied proves to be defective in materials or workmanship resulting in premature wear, during normal use of the product , within fifteen (15) years from the date of manufacture, or suffers significant fading, breakdown or degradation due to exposure to natural ultraviolet rays within the same fifteen (15) year period, SGW will, at its sole option either 1) repair or replace the affected area without charge to the Purchaser, or 2) issue a credit equal to the cost of the synthetic grass material. For the purpose of this warranty the product shall be deemed to have failed in ultra-violet stability if the original tensile strength of the product decreases by more than 50 percent. PRORATION IS AS FOLLOWS: YEARS 1-8 (100%), YEARS 9-12 (50%), YEARS 13-15 (25%). In the event that SGW elects to issue a credit in lieu of repair or replacement, said credit shall only apply to the affected area of the synthetic grass giving rise to the claim. The credit shall be issued to the Retailer, as a percentage of the replacement cost of new synthetic grass of the same or comparable quality. The credit will be good only toward the purchase of SGW synthetic grass. There will be no cash payment. WARRANTY DOES NOT COVER ANY TYPE OF MATTING ON THIS PRODUCT, REGARDLESS OF THE CAUSE. 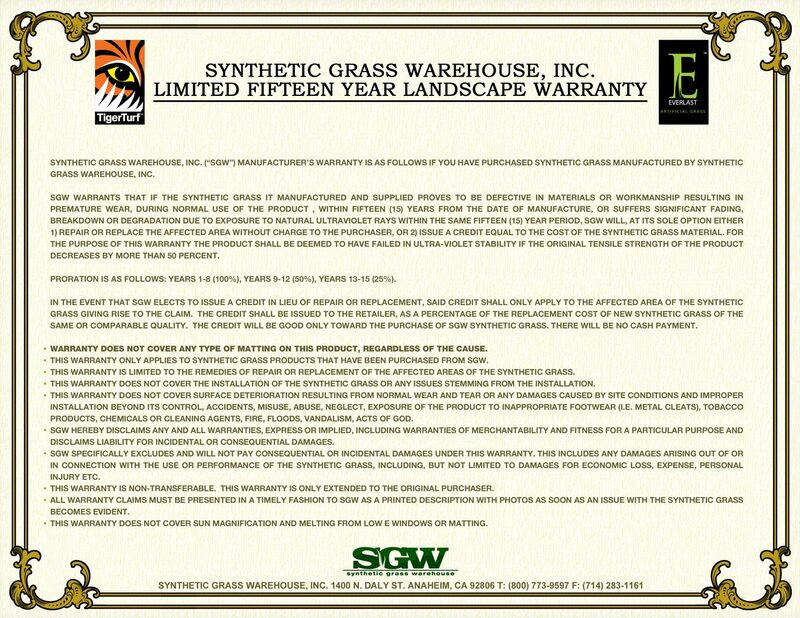 This warranty only applies to synthetic grass products that have been purchased from SGW. This warranty is limited to the remedies of repair or replacement of the affected areas of the synthetic grass. This warranty does not cover the installation of the synthetic grass or any issues stemming from the installation. This warranty does not cover surface deterioration resulting from normal wear and tear or any damages caused by site conditions and improper installation beyond its control, accidents, misuse, abuse, neglect, exposure of the Product to inappropriate footwear (i.e. metal cleats), tobacco products, chemicals or cleaning agents, fire, floods, vandalism, acts of God. SGW HEREBY DISCLAIMS ANY AND ALL WARRANTIES, EXPRESS OR IMPLIED, INCLUDING WARRANTIES OF MERCHANTABILITY AND FITNESS FOR A PARTICULAR PURPOSE AND DISCLAIMS LIABILITY FOR INCIDENTAL OR CONSEQUENTIAL DAMAGES. SGW SPECIFICALLY EXCLUDES AND WILL NOT PAY CONSEQUENTIAL OR INCIDENTAL DAMAGES UNDER THIS WARRANTY. This includes any damages arising out of or in connection with the use or performance of the synthetic grass, including, but not limited to damages for economic loss, expense, personal injury etc. This warranty is non-transferable. This warranty is only extended to the original purchaser. All warranty claims must be presented in a timely fashion to SGW as a printed description with photos as soon as an issue with the synthetic grass becomes evident. This warranty does not cover sun magnification and melting from Low E windows or matting.